If you have many gorgeous Blu-rays and want to watch them on HDTV, Xbox One or PS4, etc., easily and conveniently, you might be eager to convert Blu-ray to MPEG files and import them to these devices for enjoyment. 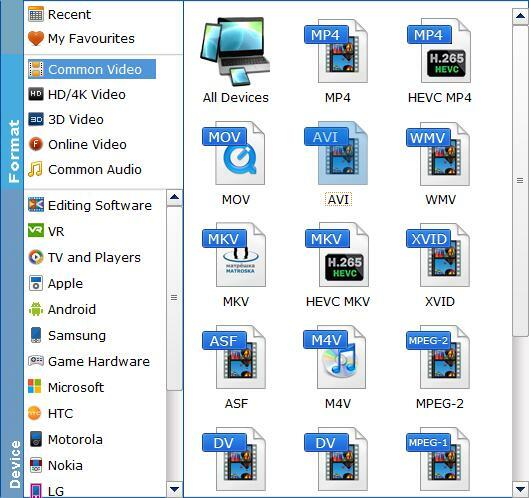 This article here will show you the best solution to rip Blu-ray movies to MPEG (MPEG-1, MPEG-2 and MPEG-4) for MPEG video players, portable media players, video sharing sites, etc. In fact, it's easy to convert Blu-ray files to MPEG as long as you got a Blu-ray Ripper in hand. As one of the best Blu-ray ripping programs, EaseFab Blu-ray to Video Converter will help you perfect convert all kinds of Blu-ray movies to MPEG video files with fast conversion speed and high output video quality in Windows (Windows 8 included). In addition, it enables you to convert Blu-ray to almost all other popular video formats like MOV, MP4, AVI, FLV, 3GP, VOB, MKV, WMV, etc. and even extract audio in MP3, WMA, OGG, FLAC, etc. formats. Get it now and follow the detailed steps below to get all done fast. After you successfully download the app, install it and run it. Then insert the Blu-ray disc you want to rip into your BD drive. After that click "Disc" button on the main interface to import Blu-ray files. This app also supports DVD discs, ISO file, IFO file and DVD folder. Tip: You can choose the subtitles and audio track for the target video on the main interface. To convert Blu-ray files to MPEG-1, MPEG-2 or MPEG-4, simply click Profile to open the format list and select MPEG-1, MPEG-2 or MP4 from Common Video as the output format. After everything is done, click the bright "Convert" button to let the Blu-ray converter do the rest for you. See, it is so easy to accomplish the process. After the conversion, you can transfer these videos to your devices for cozy enjoyment. 3. Encode Blu-ray to MPEG 4 to watch movie on your mp4 players like iPad, iPhone, Android tablet/phone, etc.